Problems with arrow flight? Want more accuracy and higher arrow speed? Easier bow tuning? Straight answers from the world leaders in arrow guidance. Why do so many experienced archer shoot feathers instead of plastic vanes? 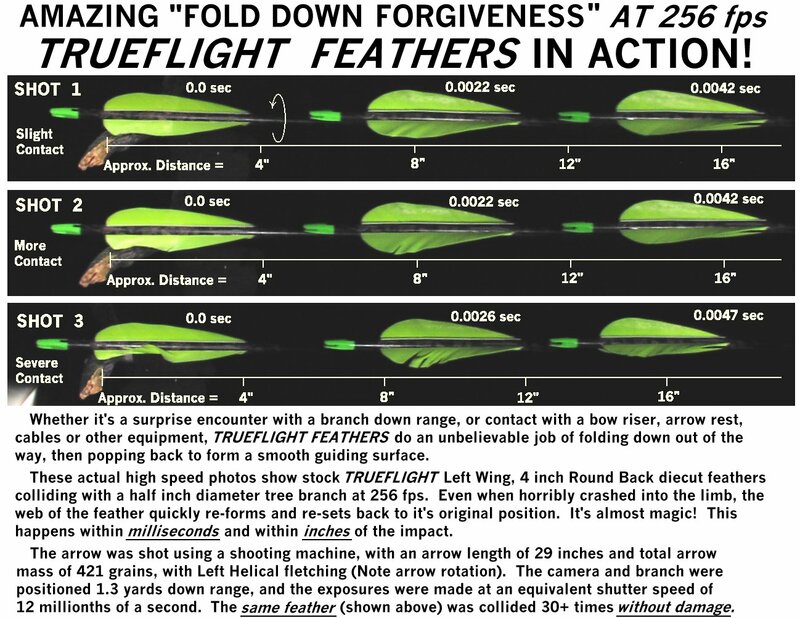 Using feathers results in higher arrow velocities, greater stability, better guidance, higher accuracy and more forgiving flight. First, feathers weigh much less than plastic vanes - as much as 700% less. This means less mass to accelerate and less energy wasted. Feathers typically save 40 grains over plastic. This is a lot of surplus mass - 30% of a typical 125 grain steel head. Second, feathers produce less friction as they travel over the arrow rest or other bow parts. Less friction means higher speed. Third, the superior guidance of feathers prevents yawing and fishtailing of the arrows. Yawing and fishtailing add drag and slow arrow speed. How much speed is gained with feathers? On typical equipment, independent tests have consistently shown a 5 ft./sec. gain as the arrow leaves the bow. What about arrow speed after leaving the bow - are feathers still faster down range? Yes. Independent tests by bow testing authority Norb Mullaney have shown that a feather fletched arrow is still traveling 4 ft./sec. faster than plastic fletch, 29 yards down range. At all normal hunting ranges, feather fletched arrows travel faster, drop less, and arrive sooner than plastic fletched arrows. Further tests by Dave Holt showed that the feather fletched arrow was faster than the identical plastic fletched arrow out to 41 yards. The feather fletched arrow then matched the plastic fletched arrow out to 61 yards (the limit of the test range). Through out the 61 yard range, the feather fletched arrow arrived at each distance in less time than the vane fletched arrow. Why do feathers give better guidance? The surface of a feather has a slight roughness which helps "grip" the air flow. When the arrows yaws, this added grip helps realign it quickly and efficiently. The huge weight saving with feathers also helps stability. Any weight added to the rear of the arrow (like plastic vanes), makes the arrow LESS stable. Add too much weight on the rear and the arrow will try to swap ends. 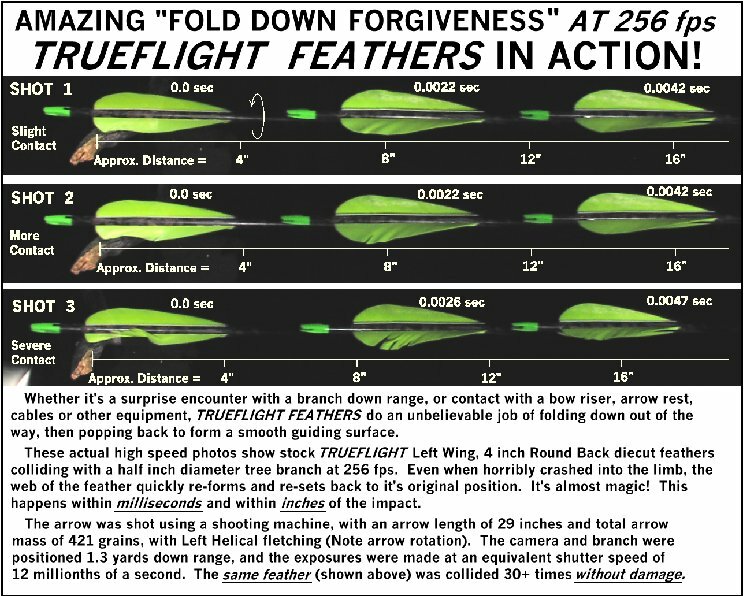 Finally, as the fletching crosses the arrow rest on release, feathers simply fold down out of the way, then pop back up. Plastic vanes bounce the rear of the arrow far out of alignment. This large deflection causes a substantial arrow "swing" which is only aggravated by plastic vanes weight and lack of "grip". Yes! While the arrow is yawed, aerodynamic forces are forcing it AWAY from its original path. The arrow is no longer going where it was aimed. Due to the sluggish straightening ability of plastic vanes, the arrow typically oscillates from one yawed condition to another. This yawing cost speed, range and accuracy. What's more, the penetration upon impact of a yawed arrow is lower than an arrow flying straight. The yawed arrow is trying trip itself, dissipating energy in an attempted angle penetration. Why is bow tuning so much easier with feathers? The feather's ability to fold down when hit eliminates the large initial swing. The light weight of feathers inherently adds to the stability of the arrow. The "grip" of the feathers adds further to clean, straight flight. The combination of all these advantages means good, consistent arrow flight is built into the arrow. Because of this it will tolerate a wide range of bow variables. Arrow rests, pressure buttons, release aids, shaft spines.. all are much less critical and require a minimum of set up. Is this what you mean by "forgiving"? I know, you or I would never intentionally mis-nock an arrow - but what about a second shot situation? Isn't it a comforting thought to know that you don't have to worry about reverse nocking an arrow, or about having your form and release 100% perfect? With feathers you're free to concentrate on the game, on the environment, and on aiming. You don't need to worry about the feather fletched arrow - it will go where it's aimed. Every time. Feathers are so forgiving that many hunters shoot right off a solid arrow shelf - with no arrow rest. Surprised? It can and is being done, even with high performance bows. This is one way to make life simple and keep equipment reliable. Again, the idea is to free yourself to concentrate on the objective at hand, not on equipment. This "forgiveness" doesn't end when the shaft leaves your bow. Suppose the arrow passes near a branch or twig. If a plastic vane touches the twig, BANG! back to a big yaw angle, new direction and lower speed. Bad news all around. But if a feather hits that same twig - it folds down and pops back up again. No yaw and no new direction. What more could you ask for? I shoot a modern high tech cam bow with carbon shafts, overdraw and all the speed up accessories I can find. Do all these advantages of feathers still apply? Absolutely! Even more so.. High performance set ups mean more energy, higher forces and lower flight times. Stability and solid guidance are even more important. Any errors or imperfections in equipment or form are magnified. Less time is available for your guidance system to do its job. Besides, if you want high performance, why bog down your arrow with 40 grains of useless mass from plastic vanes? 90% of the feathers we sell are in fact used with modern equipment. 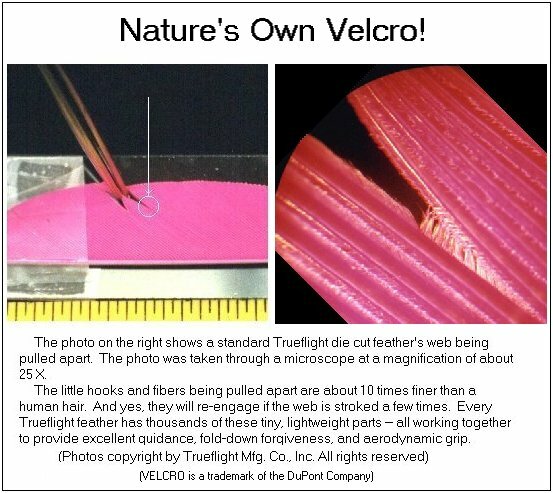 Doesn't the web of the feather fold down to the shaft at high speeds? Are there any other problems with plastic vanes? Plenty. For example, plastic's flexibility and stiffness change when the temperature changes. In cold weather plastic is stiff and rigid. In hot weather, plastic goes limp and floppy. This is one more variable which affects arrow flight, bow clearance and bow tuning. Wild cards are great in poker, but not in arrow guidance. Getting good adhesion of the plastic vane to the arrow shaft can also be a problem. Even special adhesives and laborious shaft preparation sometimes won't hold on the plastic vanes when exposed to the elements and temperature changes. 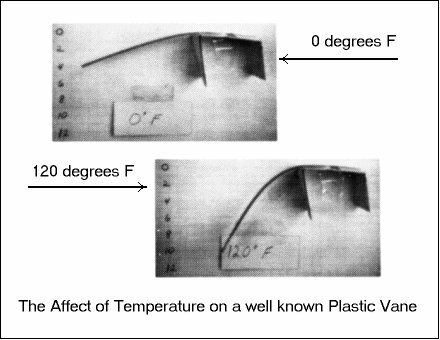 Plastic vanes are also susceptible to "fletching oscillation". Easton's ultra slow motion videos clearly showed that plastic vanes often "flap" severely when the arrow is shot. This oscillation starts at launch due to the low strength to weight ratio of plastic. It continues as the arrow flies down range. In contrast, Easton's videos showed that feathers stayed upright, stable, and steady doing their jobs exactly as they are supposed to .. even at speeds over 300 feet per second! Finally, plastic vanes just plain look cheap. Take the most beautiful camo shaft, with the best broad head and finest nock.. add plastic vanes and the arrow looks like it belongs in a toy store. Are there any disadvantages to feathers? Well, feathers do cost more. No doubt about it, it is easier and cheaper to mass produce plastic vanes. Feathers must be carefully cut with bases ground accurately. This necessarily involves a lot of hand labor. Each feather must be inspected several times as it is processed. Raw material also is hand cut and inspected. Producing quality feathers fletching is difficult, time consuming and labor intensive. But the results are worth it! For an added cost of only pennies an arrow, feather fletching gives you all the advantages. The whole object in archery is to hit where you aim. If you can't depend on that, then everything else is wasted. Compared with the costs of shafts, bows, licenses, travel, and all the rest, the cost for feathers is insignificant. What if I hunt in the rain - how can I protect the feathers? Excellent dry powder water proofing such as Bob Rightnour's "Fletch Dry" are now available. "Fletch Dry is easily applied to completed arrows, adds virtually no weight to the arrow, does not stiffen the web of the feather and does a super job of water proofing. If you don't have a waterproofing available, then a plastic "baggie" slipped over the fletching will keep the feathers dry indefinitely. Archery is a great sport and has been a challenge and pleasure for shooters for thousands of years. From the beginning, feathers have always been a part of that pleasure. If you're tired of fighting plastic, then fletch some feathers and have some fun! We at Trueflight are proud of our role in archery. We supply quality fletching - that works! Every person who gets into archery needs the chance to try feather fletching. Every person who gives up the sport because of equipment hassles and the disappointing performance of plastic vanes is a loss to all of us. No one needs the added hassles and frustrations of plastic vanes. We hope this information will help both dealers and individual archers. Your comments and suggestions are always welcome. You may find the following check list interesting. Eliminate bow window clearance problems. Can be shot off the arrow plate. No tricky arrow rest required. Less chance of brush deflection when hunting. Bow tuning is simple and less critical. Extends useable spine range of arrow. Target deflection caused by deflection of an arrow hitting the fletching of another is minimal by using feather vanes which simply push open to make room. Orientation of arrow on string is not critical. Unaffected by hot and cold temperature extremes. Aging: Feathers are unaffected by ultra-violet rays. Plastic stiffens and deteriorates. Ecologically: Feathers are natural bi-degradable products. Aesthetic: Quality die cuts have a smooth soft natural and historic appeal that can't be matched by the "toy plastic" image of plastic vanes. Go first class and hit where you aim! Dealers: Free reprints of this page (Feather Facts) for distribution to your customers are available upon request.